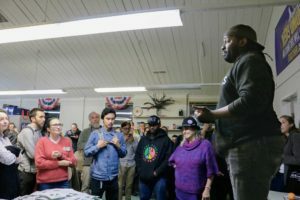 Justin Cummings stands on a chair and speaks about his journey toward becoming a candidate on Tuesday night at the SEIU union headquarters, where supporters of Measure M gathered to wait for election results. CITY ON A HILL PRESS (CHP): What’s the first thing you plan to do in office? JUSTIN CUMMINGS: Make sure that the rent freeze stays in effect […], make sure that we get something [to replace Measure M], and not lift the freeze until we do. CHP: What are your thoughts on the new composition of the council? CUMMINGS: I feel like I’ve been able to reach out to every member of the City Council […], we all have pretty positive relationships. I think we’re going to have to really work together and see different perspectives if we want to get some meaningful, positive changes. CHP: How do you feel about your historic election? I’m excited and still kind of in shock. It’s a big change, my life is going to change in a very big way. I’m just trying to process everything and what it means, and I’m really excited about being able to hopefully make some meaningful changes.